So this Flyers/Pens series really DID go on one game too long. The Pens got beat up pretty bad. They could have been on vibrating chairs at the mall last night but.. oh well. The bottom line: they won round 1 of the Stanley Cup Playoffs against the Philadelphia Flyers in Philly. And even more scary than Pen’s forward Karl Hagelin getting knocked out of the game after getting crushed with a check, is the fact that the series ended in Philly. Once the Pens’ Jake Guentzel started manufacturing goals faster than the Strip District t-shirt printers can print up 9,000 “Pittsburgh Hockey Playoffs” generic t-shirts that cheap visitors will buy, the Flyers fans started throwing trash— full beer can bottles included—on to the ice at the Penguin Players. Totally classless.. but certainly expected. Hell, at least if you’re gonna throw trash, throw them at your losing home team! Flyers fans.. you didn’t disappoint! 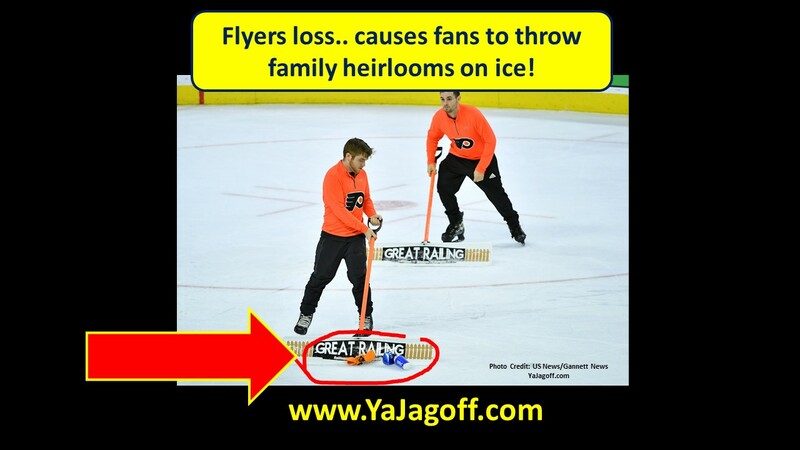 It’s just too bad that your team lost AND, in the same night, you ALSO lost all of your one-of-a-kind family heirloom pieces.. a 1/2 can of Coors Light, a tray of stale nachos and a half eaten hot dog as examples, by throwing them on the ice, Ya Jagoffs! It’s Election Day! Go Vote UNLESS…..